Central Gallery presents Carla Carpenter’s sculptural work Balls and Arrows, February 26 – March 30, with an opening Reception February 26th, from 4-6 pm. 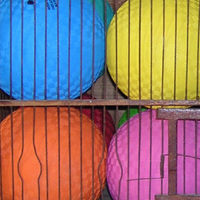 In this exhibit, you’ll see color jump, jangle and jive – barely able to be contained even when physically restricted in a work which takes the form of a cage packed to capacity with rubber balls. In one corner a well-worn pair of boxing gloves, in another a neon palette of synthetic fabric crocheted into soft sculpture. Its source? Bathing suits! On the floor sits a basket of brightly painted crosses, its neighbor, a billiards triangle filled with pool balls sitting inside a gold frame. On closer inspection the brightly hued balls are actually balls of yarn. On the wall a wooden alphabet spans the length of a narrow plank painted in primary colors. This work conjures up primary school spelling lessons. Wait! Look again, you notice the letters “U” and “I” are absent. Surprise! Pleasure and confusion are two responses to Carpenter’s twists and turns with all that is familiar existing in concert with all that is unfamiliar. From the worn 1950’s style baseball bats, to wooden ironing boards, to antique hanging racks and bird cages, one senses the consideration Carpenter has expended in selecting the objects which are transformed in her process of placement and recontexualization. Her materials originate in the detritus of flea markets, tag sales, roadside freebies and even from department store shelves. Some of the objects Carpenter chooses to work with come charged with a history of use – be it as a toy, a tool, equipment or clothing. These found objects then become further activated through Carpenter’s intuitive process of selection, placement and juxtaposition. In viewing the work one can sense the painter’s eye working in tandem with the sculptor’s understanding of objects in space. And just as soon as the color explosion saturates your senses, the eye moves across the gallery where objects possess a neutral palette. An array of objects constructed of transparent materials strut an absence of color, and yet still there exists a range of whites, a selection of beiges, a palette of creams, and then once again the familiar alphabet – not wood this time, but ceramic. And yes, as the title of the exhibition suggests – balls and arrows add to the visual delight. This showcase exhibition of an emerging new talent is a must see for art lovers with a fondness for the past and the objects of our everyday lives; sculptures that delight in the possibilities of the future while embracing the present. Central Gallery’s hours are Monday - Thursday, 3pm to 6pm and Sunday 2pm-5pm. Closed state, federal and University holidays. Call (413) 545-0680 for more information.